Maybe it was the stunningly beautiful weather we had last week that put thoughts of spring wardrobes in my head, or maybe it’s just that I have far too many things compelling me to procrastinate at the moment. Whatever the reason, a few days ago I woke up hell-bent on change, and countless hours of tinkering, fiddling and comparing minute adjustments later, this is what resulted. Actually finding a new design I liked only turned out to be only half the battle, though – that cheery orange wallpaper had been around since day one, and saying goodbye was no easy task. Who would have guessed that a few pixels could feel so much like family? But now that I’ve taken the plunge I’m feeling much better, so I’d like to invite you all to pull up a chair, grab a cold drink, and watch the paint dry before your eyes (gee that sounds like fun, doesn’t it?). Oh, and let me know what you think, of course! p.p.s. If you can’t see anything new, you probably need to clear your cache! Spring must have finally arrived in Edinburgh if you are doing your spring cleaning! I like the new look – change is good for the soul. But thanks for keeping your signature lunchbox. It’s beautiful, like your whole site, recipes and photos! I love it! Hopefully it will inspire people to send letters in proper air mail envelopes more often! I too (sniff) have to admit that I miss the cheery orange background. I am always in awe of people (and blogs) that can work orange. But I’ll admit I’m smitten with the old school airmail header. well done! Absolutely love the new wallpaper! Well…I guess I could get used to it, but it will take a while before my old eyes stop trying to stare at it until I see the 3 dimensional image of a gateau basque. I don’t suppose you’d ever consider something with like a fly-fishing motif, or duck decoys? (smiling – tongue firmly in cheek).It does look good, I like the Seattle postmark, and I really like the way you tucked in the lunchbox logo in the new 42c stamp – maybe you can get the USPS to actually print one like that…it looks great and I’d definitely buy a roll or two. beautiful!!!! totally love the new graphics. Very glad you kept the old battered lunchbox in the stamp, so sweet. The change in decor is lovely and fresh, perfect for the season. Abandoning the old for the new is always hard, but I would certainly say that the growing pains are worth it – things look gorgeous! Cheers. I think the changes look great! Very cool. And, yes, I’m sure it was the beautiful weather that made all this happen. The LOOK is great. BUT the type face size is TOO SMALL. Here on AOL I almost need a magifying glass to read your posts. After a while, I get tired of struggling to to read your posts, and, sorry to say, go on to other blogs..
Reta – I appreciate the feedback; I’ve never seen the site in AOL so I have no idea what things look like for you, but I certainly don’t want you struggling to read. Have you tried changing the font size in your browser? That’s what I do if I have trouble with small text. You can find some instructions here in case you’ve never done it. Let me know if it makes things any easier. Okay, I’ve changed the font too. I hope this is a bit easier on the eye for everyone. Looks great to me! Nice calico. That’s a cool makeover – and the ‘wallpaper’ (?) is extremely pretty! (PS Just noticed that there’s an ‘L’ missing in ‘Tallinn’). This looks pretty, but to my mind previous design was a little better. The letter header is just amazing, but these flowers in the corners are too intensive… However, i personally think, that your food blog page, design and photography is one of the best i have ever seen. Hi Melissa,I’ve been following your blog since ages, and loved everything here from the photography, writing style, content to the blog design. Your header caught my attention as it was creative while still maintaining the essence from the previous header. Love it! I really really like this look. The older one was great too, but I like this one a lot and the enveloppe header thingi is so great! I guess finding a new look for a blog is like finding a new pair of jeans- not an easy matter! hi mel, i like the wallpaper too, its real pretty, but i do think it could be a bit narrower in spread, it seems to me it occupies a tad too much of the page. maybe its the same as ur last in width but since its a busy pattern it feels more intense. big kiss! Felicia – It’s really easy. If you have a flickr account, just upload your photo and choose the option above it that says ‘edit photo’. This will take you into picnik editing software, and from there click create > frames > rounded edges, and adjust the slider to get the amount of rounding you want. If you don’t use flickr, you can use a site called pixenate; just upload the photo from your desktop, under ‘show fun effects’ choose ’round’, and set the radius (probably something between 5-15), before saving the result back to your own machine. There are apparently ways to do it in photoshop too, but they’re quite a bit more complicated. p.s. Thank you! Much better with the thinner sides…the pattern was a bit overwhelming before. Now, very pleasing. The header is beautiful but the wallpaper on the sides is really, really distracting. The simplicity of the single color allowed every dimension of your beautiful photos to come through. The floral pattern competes with your photos. It’s absolutely gorgeous Melissa! I love the whole vintage look – the banner, the flowery background and the frazzled (don’t know if that’s the right word) edges like an old photograph. 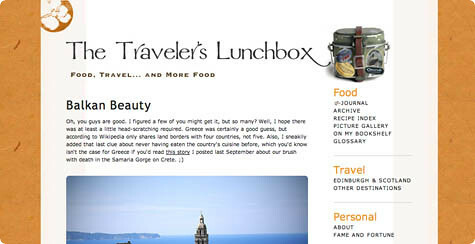 And the original traveler’s lunchbox is still there! Beautiful. Looking forward to seeing more recipes. Hi Melissa,Very nice design! I too have always gnashed my teeth at how small the font is on your blog. I use a Safari browser on a Mac and always have to hit the "Make Text Bigger" button. This blog is the only one I need to do that with. Any way to make it bigger without ruining everything on your end? Meredith – I increased it by a point. Is it better now? It’s looking great. I appreciate the typeface change, too. (Old lady eyes here.) The little Victorian print looks like the lining of an old trunk- very charming and travel-y. How lovely. And what a wonderful site you have. I’m embarrassed to say I’ve never been here before…Now I have to remember how I got here! The angst of redesigning our blogs!I’m really feeling it and can relate. I’ve changed the look of my test blog three times now and I just can’t bring myself to take the plunge and revamp from my blogger template. Security and familarity win out.Hope you continue to enjoy your new look. I love, love, love, the look of this blog. What platform do you use and also, if you have time, what camera equipment. It’s stunning. Thanks for sharing.